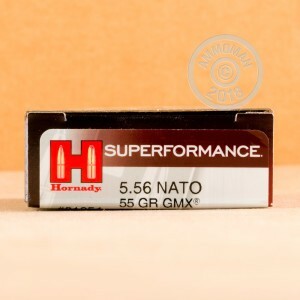 This 5.56x45mm cartridge from Hornady’s Superperformance line of ammunition is crowned with a 55 grain GMX projectile. The GMX is long and sleek, and features both pressure relieving grooves and a crimping cannelure which work in conjunction to reduce its bearing surface, drag, and the amount of residue it leaves behind in the bore. It’s a highly effective option for hunting medium-sized game, as its hollow point will cause it to mushroom outward so it has a better chance of destroying a vital organ. Most appealingly, the GMX’s monolithic copper alloy construction means that it has no core and jacket which are capable of separating, so it delivers no less than 95 percent weight retention during penetration. It further fouls very little, and is compliant with California’s laws barring lead projectiles. 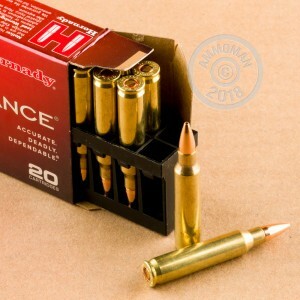 Superperformance ammo improves your rifle’s muzzle velocity without adding more recoil, muzzle blast, or chamber pressure. 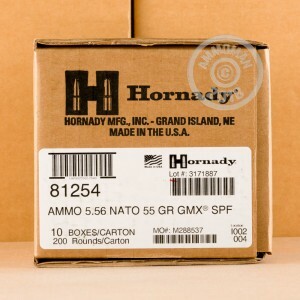 As with all of Hornady’s ammunition, these 20 rounds were very carefully inspected so as to ensure each one performs identically to the last.